This was created by cleaning out the fridge. It quickly became one of Mr. LB's favorites. the "Use it up," category. 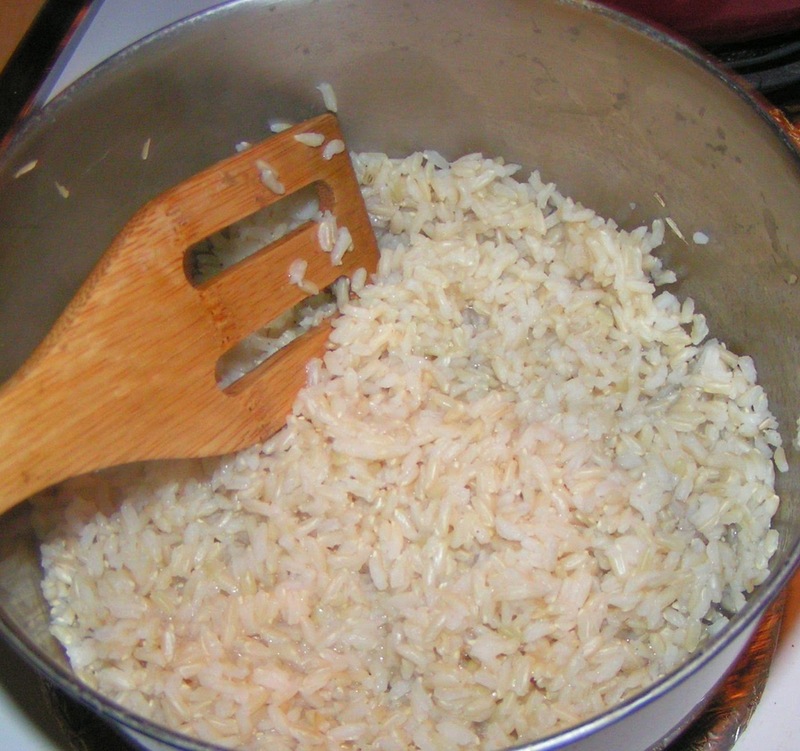 We use brown rice which takes longer (about 40 min.) to cook. So first get the rice started. in cast iron skillet slightly larger than you would need to cook only the meat. I use about 2 pounds. If you have a large family, multiply accordingly. While the meat is cooking, add garlic salt and pepper. 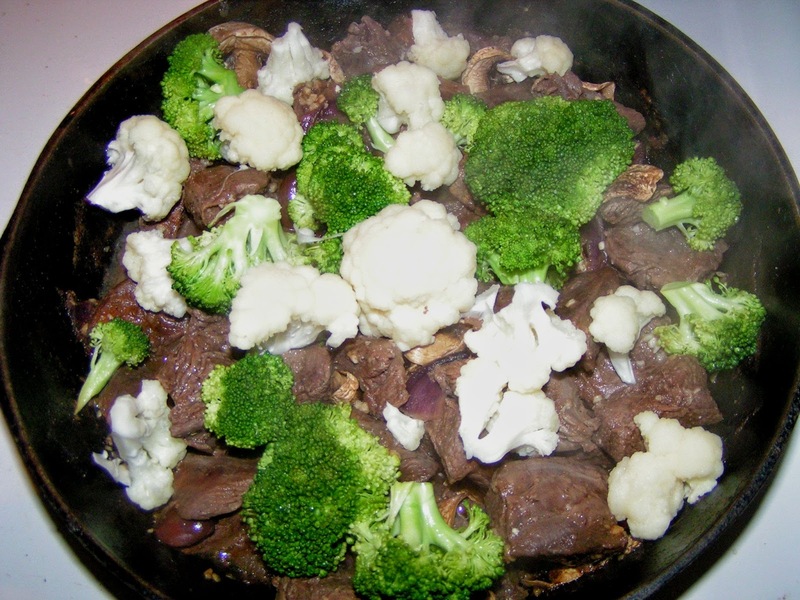 Also prepare about 1+ cup each fresh broccoli and cauliflower. add the olives, mushrooms and 1-2 tbl. Worcestershire sauce. are mixed into the meat evenly. Add about 1/4 cup water and cover for about 5 min. By this time, rice should be just about ready. Turn off burners! That's very important. then cover with meat mixture. 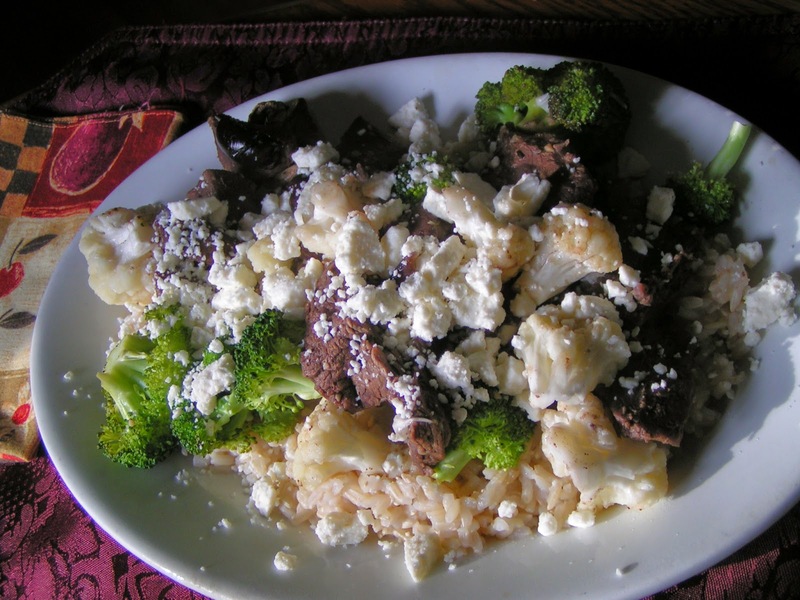 Sprinkle feta cheese over all this. really are meant for red meat. Also, if your venison is 'gamey,' rinse it well before cooking. by rinsing, it leaves only the yummy meat flavor. This looks tasty! Would love for you to add this post to our link up this week as I am a big fan of "use it up" recipes! Also, thank you for the hint about the gamey-ness being in the blood. We try and remove all blood from our meats prior to cooking and this is now an added bonus reason! "The Locust Blossom" has been included in my Arlynda Lea's Sites to See #3. I hope this helps to call more attention to your efforts.